Who says your daily driver and your weekend warrior can`t be the same vehicle? 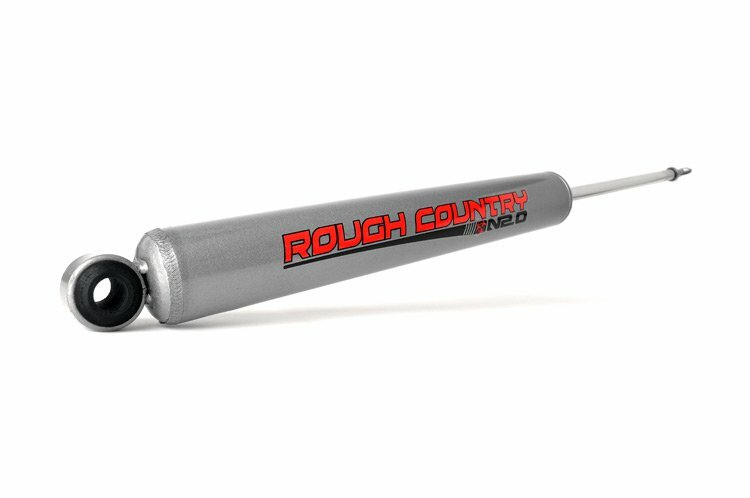 Introducing The N2.0 Shock absorber: Engineered by Rough Country`s Research and Development Team specifically for both on and off-road use. N2.0 shocks are nitrogen charged at 200-psi to prevent foaming and offer a longer lifespan. Incorporating "Velocity Sensitive Valving" technology, these shocks utilize a 10-stage variable valving process that helps facilitate resistance valving incorporated in the shock according to piston rod speed. This allows for a super smooth highway ride and outstanding control in rugged off road situations from the same shock, without turning any knobs or shock removal for re-adjustment. Each shock is tested and custom tuned for its specific vehicle application. It`s Chromed Hardened 9/16-inch Piston Rod, and massive 1.375-inch Bore, allow for fluid movement while providing the type of heavy duty durability needed in off-road situations.